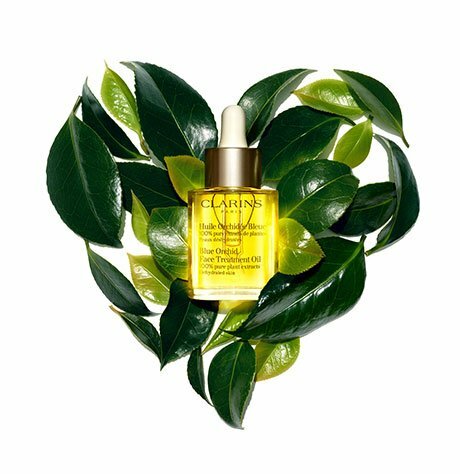 Refreshing bi-phase serum for thirsty skin that feels tight, lacks radiance and is prematurely lined. Shields skin from the dehydrating effects of daily thermic shocks that can leave it looking dry and weathered: sudden temperature changes, indoor and outdoor pollutants and environmental stress. Quenches skin with Organic Leaf of Life extract—a succulent plant that enhances the skin’s ability to retain precious moisture—leaving it plump, radiant and perfectly hydrated. *Satisfaction test - 106 women - from the first application of Hydra-Essentiel Bi-phase serum + Hydra-Essentiel Moisturizer. 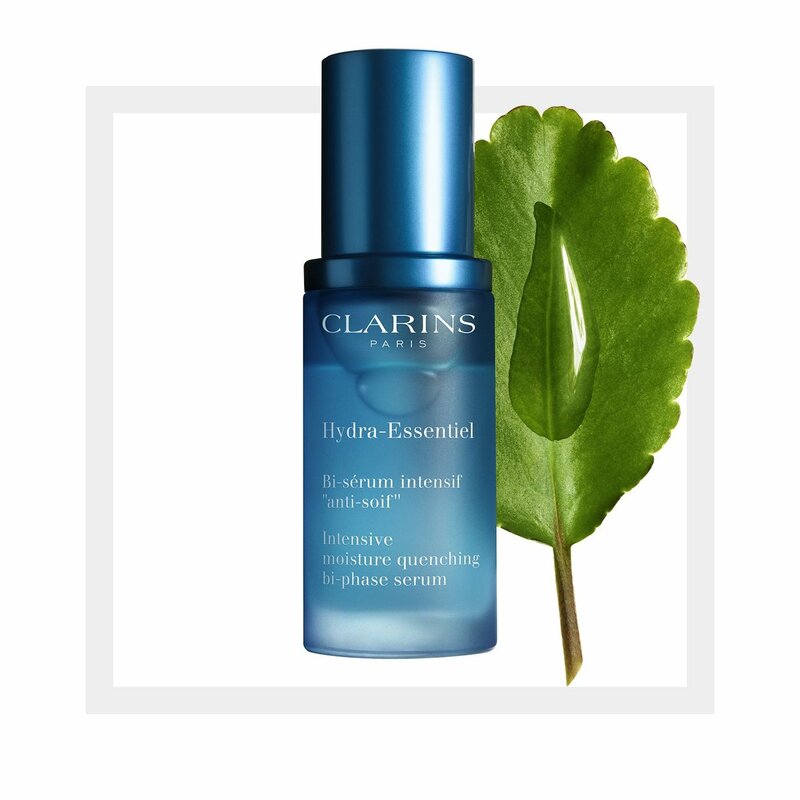 Follow with the Hydra-Essentiel moisturizer for your skin type. Rated 5 out of 5 by gabrelle_gabby from Convinced that it works I've used a 1.7oz bottle as well as a .3 oz sample of this product already. I will keep buying and using this product. At first I was skeptical about the usefulness/necessity of this product since its use is to hydrate the skin. However, after using the deluxe sample that I received I found that this does increase the moisture of my skin. I still need to use a moisturizer over this, but I'm sure this serum increases moisture beyond what a simple moisturizer can achieve. Rated 3 out of 5 by MichelleH from Quickly absorbed by skin but no notable difference I have sensitive, oily skin with redness & acne scarring. In the winter, particularly, my skin becomes slightly drier. At the recommendation of a Clarins associate, I received a 15mL sample (0.5 Fl.Oz) for use, which lasted me about a month (using about 4 pumps a day (2 in the AM and 2 in the PM)). The serum has a slight floral scent and feels slightly oily. I was a little weary how this would affect my sensitive skin. Luckily, I did not notice any breakouts after starting to use. While it sinks into the skin quickly, that's pretty much it. I didn't notice any changes in the redness or any changes in texture. Perhaps one would need to use the complete Hydra-Essentiel collection to notice a difference. Overall, this product did not work for me. Rated 5 out of 5 by hs18 from Intense yet gentle This product is great, it leaves you with a super quenched-like feeling for your skin. My skin can be prone to be oily sometimes, too, and though it says its for "dry skin" I've found this product to not be too heavy if applied judiciously. I wash my face twice a day and use this right after my face is done drying and has that dry or tight feeling. Working great for the winter times, too. Rated 2 out of 5 by lolacoco from Allergy alert! I have, individually, sensitive skin. I got this product sample at the mall and tried it out for about a week. What happened to my skin gradually made it worse. I am not using it now and feel better. If you do not have sensitive skin I trust it will work out fine with you, yet if you have extremely sensitive skin it means best for you not to try it out each day. Do it one day and see how your skin reacts. Rated 3 out of 5 by MeliaM from Did Not Notice Any Difference I have been using the Hydra Essential Serum for a couple of months and not seeing any difference. Rated 5 out of 5 by Anonymous from Great product I've been using this for several months and love how it preps my skin for my moisturizer. Rated 4 out of 5 by ellN from No, but then yes! Very lightweight, absorbs quickly. Sadly I found that this product caused a bit of breaking out on my face. Promptly re-ordered Double Serum that i had been using before and was going to return this but tried it on my chest area. Voila! The (very thin) skin on my chest looks and feels better than it has in years! Rated 1 out of 5 by TheRealMissMuffin from Bring back the old formula I was so disappointed when I received this. I have used the HydraQuench serum for years & loved it. Why change a good thing? I won't be purchasing this again.